The picture on the left is of a Cocker with a very unusual coat pattern. It's called merle. That's not the name of the dog... merle is the term used to describe the unique markings of his coat. It occurs because of a gene that dilutes the color in some of the individual hairs. The dog's name is Rhett, and he used to live a few miles from us. His father is our (now retired) stud dog, Jake. But his unusual coat color didn't come from Jake's side of the family, it came from his mother... who also has a merle coat like Rhett does. Because of the unusual mix of black and grey (diluted black) hairs, his black coat takes on a blue tint if allowed to grow out long. You can see it in this picture. Because of that blue look, dogs with this type of coat are called blue merles. The coat is really just comprised of varying shades of both diluted and undiluted black hairs, so maybe the term black merle would have been more technically correct... but the commonly accepted description for this type of coat is blue merle. It used to be very unusual to find American Cocker Spaniels with merle coats, but over the last 10 or 15 years it has become more common... as the puppy mills started to get in to breeding merles in a big way, once they found they could get more money for what was perceived as a "rare" color of Cocker. While the pattern is common and considered quite acceptable in several other breeds, it's not even recognized as an official coat pattern for the Cocker by the American Spaniel Club, and up until recently you couldn't even register a Cocker as a merle with the AKC. More on that in a minute... but first, what exactly is merle? The merle gene causes a dilution of the color in the coat... making the color lighter than it normally would be. But it doesn't evenly lighten the entire coat, it just lightens patches of it. You can clearly see the patches of normal black fur and diluted (grey) fur when the dog is given a short hair cut, or in a young puppy like the one in the next picture. Merle coats are often confused with roan coats in American Cocker Spaniels... but there's one easy way to tell the difference between a merle and a roan. Cockers with merle coats display their unusual markings from day one. Cockers with roan coats don't look unusual at birth but slowly grow in to their unique coat coloring. Roan and Merle -- The dead giveaway that a merle are those dark black patches of fur mixed in with the lighter grey areas of fur... clearly visible in the left side of the picture. Without the merle gene, this dog would be solid black. Sometimes it's hard to tell merles from roans in older dogs, but it's very easy if you can find a picture of the dog when he was a newborn. I mentioned that merles get their unique look because of a gene that causes a dilution in the coloring in the fur. For this reason, some breeders refer to these type of dogs not as merles, but as dilutes. Different terminology, same thing. I like to call them merles because that's the term that the other breeds use for this same coat pattern. Sometimes, but not always, the merle gene not only dilutes the fur but it also causes a dilution to the coloring of the eyes. Dogs with merle coats often have an unusual blue/grey or silver color to their eyes. Sometimes only one eye is diluted, sometimes only a portion of one eye. Unfortunately, there's one other thing that is commonly associated with merles... and that is deafness. A significant percentage of merle Cockers have hearing problems. In fact, this is just one of several major health problems that are very common when a merle Cocker is bred to another merle Cocker. Breeding a merle to a non-merle is less likely to lead to health issues, but that's kind of like saying that playing Russian roulette with 1 bullet is less likely to kill you than playing Russian roulette with 3 bullets. Check out this video about merle health issues, at the web site of the American Spaniel Club. It's important to emphasize that merle is not a color, it's a type of marking or a pattern in the coat. Cockers with the merle coat pattern can come in a variety of colors, as you can see in this picture of Savannah nursing her litter of puppies. If you look very carefully you can see (from left to right) two dark brown merles, a black & white parti, a black merle, a light brown merle, a red & white, and a solid chocolate. The variety of colors in this litter is due to the fact that the mother is a blue merle with tan points, and the father (our now retired stud dog, Jake) is a brown and white parti. Here is a close-up view of just the merles from Savannah's litter, pictured at just a day or two old. See those dark spots mixed in with the lighter colored fur? When you see that on a pup this age it's as good as having a big sign on them that says "I'M A MERLE"! If these pups had been roans, they would not show any unusual coloring at this age. Once you know what to look for, it's easy to spot merles. Just as "regular" Cockers come in lots of different colors and shades... merles do, too. What we have in this picture are two solid brown merles in the upper right, a brown merle parti in "the 6 o'clock position", and a blue merle in the lower left corner. If not for the merle gene, the two in the upper right would have been solid chocolates, the one in "the 6 o'clock position" would have been a chocolate & white parti, and the one in the lower left corner would have been a solid black. When breeding a dog with a merle coat pattern (any breed, not just a Cocker) it's absolutely vital to follow one rule: you must NEVER breed a merle to a merle. There's something in the genes that causes a defect if two merles are bred together. Mating two merle dogs usually results in many puppies that are born either deaf, blind, or so severely damaged that they are either stillborn or die shortly after birth. Up until 2011, there was a problem when registering Merle Cockers with the American Kennel Club. The AKC registration form did not recognize merle as a possible coat pattern in Cockers. The AKC did recognize roans, but not merles. So most merle Cockers ended up getting registered as roans, even though genetically merle and roan are two very different things. This changed in 2011, when the AKC started allowing merles to be registered as merles. But remember, even though they can be registered, merle Cockers are still very much the outlaws of the Cocker world... and "good breeders" generally will not use merles in their breeding programs, due to the health issues. So, it's very much a red flag if you are dealing that a breeder or a seller of merle Cockers. Over on the right side of the screen is another brown merle Cocker. His name is Milo and he lives in New Mexico. Because his hair is trimmed fairly short, you can easily see the dark brown patches mixed in with the light brown patches. The same dog with long hair would have a totally different look because the dark brown hairs would blend in more with the lighter ones. If this dog did not have the merle gene, he would be a chocolate parti... but the merle gene has caused all but some small patches of his chocolate fur to be diluted to a tan color. 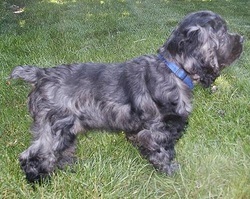 While the merle coat pattern is very uncommon in American Cocker Spaniels, it's not at all uncommon in several other breeds. The picture on the left is a Sheltie with what the Sheltie breeders would call a blue merle coat. It's basically just a black & white Sheltie with a lot of diluted black hairs, which makes his long coat take on a blue tint. You'll also find merles in Australian Shepherds, Collies, and several other breeds. Interested in learning even more about merles? There's some very good information here. Even though it is written with Shelties in mind, most of the information applies to merles of any breed. Please note: We do not currently have any merle Cockers, nor do we anticipate breeding any in the future. Please don't write to me in hopes of buying a merle Cocker. We don't have any, and we won't be making any. This page is not an "advertisement" for merle puppies... it is an informational page written with the hope of educating people of the dangers of breeding merle to merle.